India’s Watershed Vote: Hindu Nationalism in Power? Will India under the BJP see a period of renewed communal violence, or will Hindu-nationalist politicians be reined in by constitutional constraints and their desire to stay in power? A review of Crafting State-Nations: India and Other Multinational Democracies by Alfred Stepan, Juan J. Linz, and Yogendra Yadav. 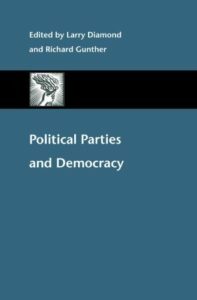 Political parties are one of the core institutions of democracy. But in democracies around the world, there is growing evidence of low or declining public confidence in parties. But are they in decline, or are they simply changing their forms and functions?